Our school room is constantly evolving depending on what we need from it at any given time. 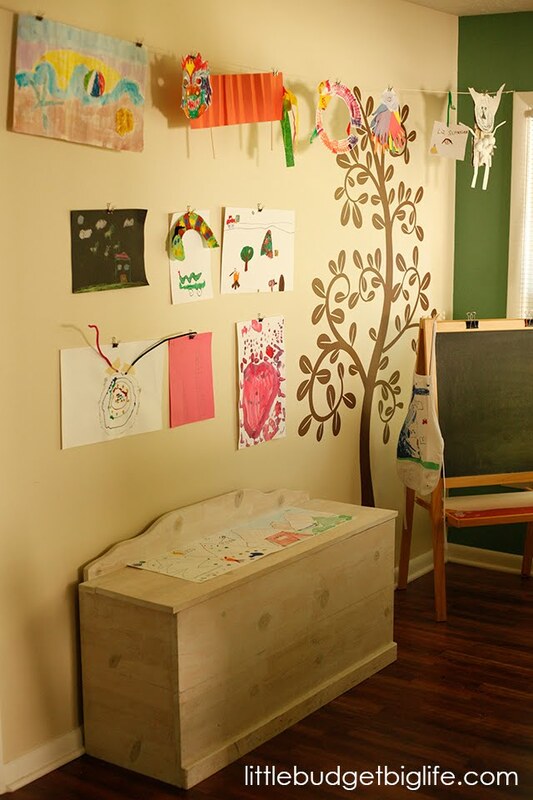 Lately its primary function has been as a catch-all for art projects. Yesterday, I decided that we couldn't have all this artwork piled up on every flat surface any longer. Pip and I got to work with 8 nails, some kitchen twine, and a handful of small binder clips, all of which we had around the house, and we created a gallery to display her most recent pieces. 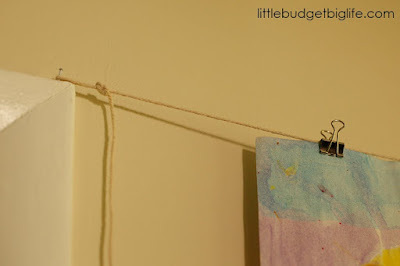 First, I placed one nail in the top of a door frame and one nail in the top of a window frame, knotted the ends of a pieces of kitchen twine, and strung it between them. 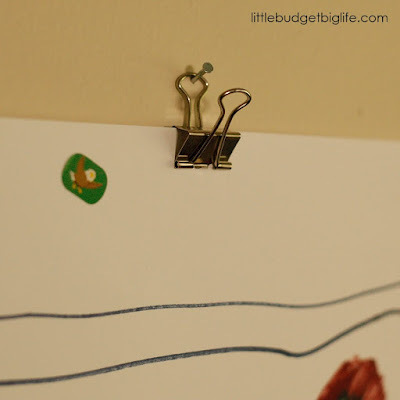 Then we used binder clips to hang several pieces across that line. Next, I placed 6 more nails in the wall below the line and above the bench, putting them roughly the same distance from each other. I hung a binder clip on each one and together we chose which pieces she wanted to display. My intention is for this to be a rotating gallery of whatever Pip has recently created. When we stepped back to take a look at the finished product, she was proud of it, and I was happy with our return to clear surfaces. So cute!!! I need to do this at our house! 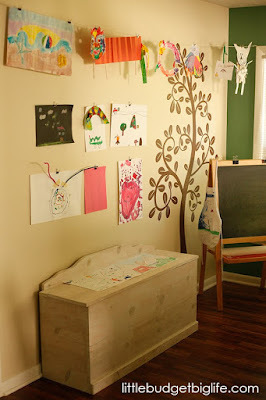 It looks nice - and I bet the kids love seeing their artwork displayed! Oh yes, it was a hit! I love this! It's a wonderful idea!